And check out OUR NEWLY LISTED ITEMS. 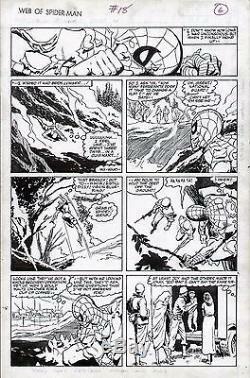 This is an original art page from Web Of Spiderman #18, published by Marvel Comics in 1986. 6, and is an awesome page with artwork by the brilliant Marc Silvestri. It features Spidey in almost every panel, with his costume torn up after the explosion. Silvestri is a legendary Modern Age artist, known for classic work on so many characters and titles, including Wolverine, Uncanny X-Men, Cyber Force, The Darkness, Witchblade, Spawn, Conan the Barbarian, Batman, and so many others for Marvel, DC, Top Cow, and Image Comics. The inks are by the excellent Kyle Baker. Don't miss out on a chance to get an awesome piece that would look fantastic framed and prominently displayed, and would be an outstanding addition to any collection. Check out our other auctions for more great items. Check it out, you'll be glad you did! The item "MARC SILVESTRI 1986 WEB OF SPIDERMAN #18 ORIGINAL ART PAGE MARVEL COMIC ARTWORK" is in sale since Monday, June 12, 2017. This item is in the category "Collectibles\Comics\Original Comic Art\Interior Pages".